The exhibit of photographs by famed music scene chronicler Mick Rock at the Sumo Gallery in Tribeca ends Sunday. But have no fear, Rock and rock fans. Per a Q&A with The Observer’s Matthew Kassel, more is on the way. 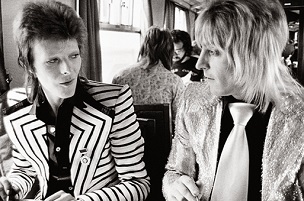 Rock also has a fun answer to the question, “Is it easy to photograph David Bowie?” He collaborated previously with the superstar on Moonage Daydream and authored, in the early 1970s, the tome The Songs of David Bowie.